The Butler Chain-of-Lakes consists of 11 interconnected waterbodies located in south Orange County with a combined surface area of more than 5000 acres. The Butler Chain-of-Lakes were designated as an Outstanding Florida Water (OFW) in 1987 and the lakes typically exhibit excellent water quality characteristics. During 2004-2006, ERD developed an overall nutrient and hydrologic budget and comprehensive management plan for the entire Chain-of-Lakes. A hydrologic budget was developed which included inputs from direct precipitation, direct runoff, shallow groundwater seepage, deep groundwater recharge, and flow between interconnected lakes. ERD performed continuous measurements of direct precipitation and evaporation within the drainage basin from January-December 2005. Inputs from shallow groundwater were estimated by direct measurement of groundwater seepage using 64 shallow and deep seepage meters installed within the lakes. Flow between interconnected lakes was estimated based upon continuous flow monitoring performed by ERD. 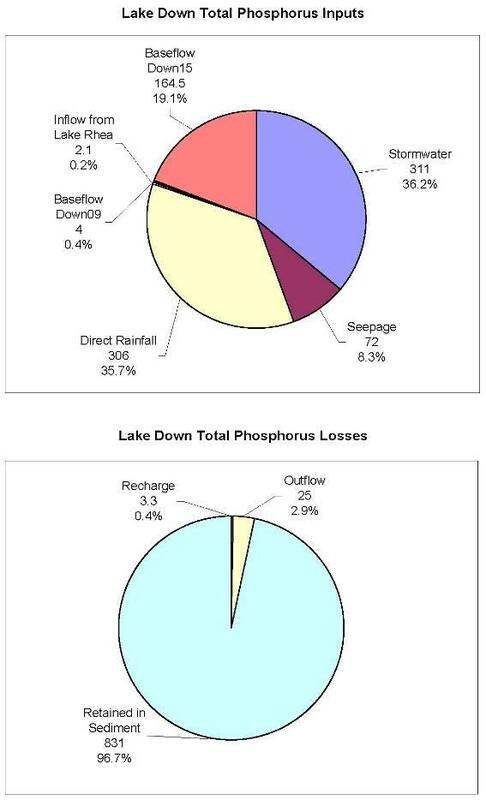 Nutrient budgets were calculated for each of the 11 lakes to include mass inputs from bulk precipitation, shallow groundwater seepage, mass losses to deep groundwater, runoff inputs, internal recycling, and flow between interconnected lakes. Collection of bulk precipitation was performed by ERD within the watershed from January-December 2005. Estimates of mass inputs from shallow groundwater seepage are based upon the field measurements performed by ERD. Continuous monitoring of tributary inflows was conducted for a period of 12 months, and a stormwater monitoring program was conducted to evaluate runoff characteristics from significant sub-basin areas. Sub-basin delineations were determined for each of the 11 lakes. At the conclusion of the monitoring program, ERD used the data to develop hydrologic and nutrient budgets for each lake. This information is used to identify significant sources of nutrients within each drainage basin and provides a method of evaluating recommended management options. A water quality model was developed, consisting of an interlinked series of spreadsheet models, which estimate hydrologic and nutrient loadings and resulting water quality characteristics within the Chain-of-Lakes. This model allows evaluation of potential water quality treatment projects for use in prioritizing projects with the greatest potential for water quality improvement. 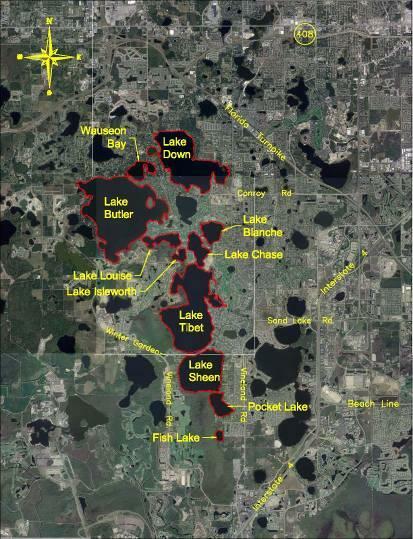 A management plan was developed for the Chain-of-Lakes based upon structural, non-structural, and regulatory approaches to controlling and reducing pollutant inputs into the Chain-of-Lakes. Since phosphorus is the limiting nutrient within the Chain-of-Lakes, a management philosophy was adopted to maximize phosphorus removal. Management options are evaluated for stormwater/baseflow treatment, rear yard swales and berms, sediment and erosion control enhancement, establishment of vegetated shorelines, restrictions on lawn maintenance activities, improvement of septic tank designs, stabilization of erodable roadway and drainage system surfaces, enhanced stormwater regulations, and restrictions on boating activities which degrade water quality. Conceptual designs were prepared for three different structural treatment alternatives. Estimated pollutant load reductions, capital opinions of probable construction cost, estimated annual O&M costs, and present worth costs were developed based on the conceptual designs.